There have been few metal bands as constant and consistent as Kamelot. In existence for nearly 25 years, they have delivered eleven studio albums, the latest being Haven. It's another Kamelot power house: melodic and progressive power metal wrapped up in a nearly cinematic symphonic soundscape. Kamelot's musical tapestry has always been bold and bombastic. They don't so much want to crush with thier sound, but surround and overwhelm you, envelope you and make you a part of the music. They do this with the familiar parts. Large riffage, lush orchestral layers, the assertive and thundering rhytym section, Thomas Youngblood's fiery leads, Oliver Palotai's swirling synth solos, and Tommy Karevik's dramatic voice. However, as seems usual, excepting the more quiet parts, Karevik is not easily heard. Some of this comes from the symphonic power metal getting the upper hand in most arrangements. Having the lyrics handy, which I did not from the digital promo, will make a considerable difference in your listening experience. Probably more significant is Youngblood and Kamelot's natural ability to bind those aforementioned elements in deliberate and infections melody and harmony. It's what continues to make the Kamelot sound both majestic and accessible. A good example is Veil of Elysium, a large, breathtaking number, which turns nicely on the melody of the chorus. Another is Insomnia where, from the start, the chord structure and symphonic layer are both leading and catchy. A good groove underneath builds early, complimented again by a fine harmony in the vocal arrangement and chorus. Sometimes, simply, Kamelot can be heavy and explosive as with Citizen Zero and Liar Liar, yet both have moments of contrast, subtle lightness that could be missed. 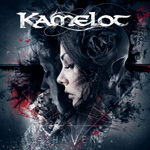 Kamelot opts for more aggressiveness by adding some death metal vocals to the already heavy and charging tune Revolution. Alternatively, there are gentler moments as with Under Grey Skies. An acoustic and symphonic song which builds evenly to crescendo, it finds Karevik in duet with Charlotte Wessels from Delain. It's also the song that best displays Karevik's vocal depth. It's quite moving overall, my favorite song here. Hey, it's all good. Pure Kamelot: what you expect, but always creative and intriguing. Easily recommended. 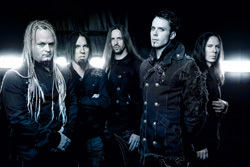 Haven is pure Kamelot: what you expect, melodic and symphonic progressive power metal but always creative and intriguing.